Looking for a cryptocurrency exchange which is secure, with a huge coin listing and where trading fees will not empty your pockets? ADZbuzz is exactly that. It is secure, it will have a huge list of coins and trading fees are one of the smallest on the market. It’s unique concept will attract crypto traders from all around the world and it will be one of the top exchanges in the world. Trade with all your favorite cryptocurrencies. New coins are added through public voting system. Get 100% trading fee back with every single trade you make. Invite friends to ADZBuzz Exchange and get a bonus from all their trades. Use the bonus wallet earnings to create a passive income. The main purpose of ADZbuzz Exchange is to give people the opportunity to create a daily passive income through its unique bonus wallet feature. And at the same time give crypto traders the platform that is secure and which has one of the smallest trading fees on the market. The goal is to become the top 50 exchange before the end of 2018 with the trading volume of over 10 Million USD in 24h. And from there the aim is to become the top 10 exchange with the trading volume of over 200 Million USD. 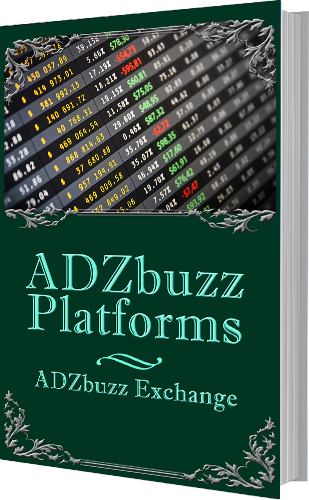 It is really achievable with the features ADZbuzz Exchange is bringing to the market. In addition to small trading fees and secure exchange, ADZbuzz will reward all traders with bonus funds every time they trade in the exchange. ADZbuzz will also reward its affiliates every time their referrals will execute a trade on the platform. Regardless of the fact that ADZbuzz Exchange trading fees are one the smallest in the market you get 100% fee back to your bonus wallet. The percentage will be decreasing over time whenever a certain amount of total trading fee is reached. Earnings from Bonus Wallet can be used to purchase ADZbuzz products. The most attractive way to spend your bonus money is to purchase ADZbuzz community tokens. Every community token represents a share of a specific ADZbuzz community. Owning community tokens will give you daily passive income which comes from the revenue the community is creating. ADZbuzz Exchange will give anyone the chance to list their coin through public voting. Join ADZbuzz Forum discussion and vote for your favorite coin. NB! You have to register first to be able to give your vote. Coins are being added to ADZbuzz Exchange in packs of 10. It means top 10 coins will be added to the exchange and once those coins have been added, fresh top 10 coins will be added to the exchange. This cycle will be processed endlessly. To easily find your favorite coin from the voting list, use Ctrl+F and type the name of your coin. If the coin is not listed on the voting list yet, ask the ADZbuzz team to add it to the list in the same thread. The main security policy is that there are never funds in so-called “hot wallets.” ADZbuzz is keeping 100% of your funds in encrypted offline wallets which are backed up in cold storage on a daily basis. On top of that, there is a multi-level automated security system built in as well as a double manual verification before any funds are being withdrawn. Those security measures will make the process of withdrawing your funds much slower. But this is the price you pay when you want to have the best possible security for your funds. And keeping member’s funds safe and secure is the main objective of ADZbuzz. In addition to everything above, ADZbuzz Exchange has a very lucrative affiliate program too. You will get 50% of your referral trading fees to your bonus wallet. The percentage is decreasing over time whenever a certain amount of total trading fee is reached. To know how to use ADZbuzz Exchange and how to trade there, go to ADZbuzz Tutorials. There you will find all the information you need to have the best experience with ADZbuzz Network. To know more about other ADZbuzz Platforms, choose the topic below. Looking for a new logo for your business or need some video editing. ADZbuzz Services will help you get things done with small fees.